This newly created role is dedicated to both the State and Federal Politics rounds. This makes me wonder if WIN are planning on increasing the scope of their news operations, possibly dumping Nine News in favour of producing their own all encompassing local/national/international bulletins similar to the way ABC TV handles local news in Canberra or the way Ten Capital used to produce an hour-long local/national/international bulletin instead of broadcasting Sydney’s Ten News. If they do, it will be interesting to see if they can rate better or do a better job than Nine News. It would, in Canberra at least, provide a locally-focussed alternative to the Sydney-centric 6pm bulletins. I hate, and I really do mean hate, corn flakes. They taste like cardboard, and they are hopeless as a cereal as they become soggy far too easily. Whilst they are nice and crunchy when dry, they aren’t particularly appetising. You can imagine how pleased I was when I found out that global warming is going to make corn flakes a potentially fatal meal…finally we can rid the planet of these awful little flaky things. Climate change could lead to “killer cornflakes” with the cereal carrying the most potent liver toxin ever recorded, an environmental health conference has been told. The effects of the toxins, known as mycotoxins, have been known since the Middle Ages, when rye bread contaminated with ergot fungus was a staple part of the European diet, environmental health researcher Lisa Bricknell from Central Queensland University (CQU) said. “People started suffering mass hallucinations, manic depression, gangrene, abortions, reduced fertility and painful, convulsive death,” Ms Bricknell told the 10th World Congress on Environmental Health in Brisbane on Tuesday. Mycotoxins can appear in the food chain as a result of the fungal infection of crops in the field or in storage, either by being eaten directly by humans, or by being used as livestock feed. Ms Bricknell said there had been outbreaks of high levels of aflatoxins in Australian crops in recent years and global warming was providing a new threat to food safety, with temperatures expected to rise in inland areas of the eastern states while rainfall was tipped to fall. “In a situation of climate change, if we are importing more products and imported products are not regulated … we can also expect that other countries may be experiencing similar problems with increased contamination. The end of cornflakes almost makes me want the global temperature to stop falling. This took me by surprise…and for a poll like this to take me by surprise, it must be surprising! For just the second time in more than five years of daily or weekly tracking, Republicans now lead Democrats in the latest edition of the Generic Congressional Ballot. A new Rasmussen Reports national telephone survey found that 41% would vote for their district’s Republican candidate while 38% would choose the Democrat. Thirty-one percent (31%) of conservative Democrats said they would vote for their district’s Republican candidate. Overall, the GOP gained two points this week, while the Democrats lost a point in support. Still, it’s important to note that the GOP’s improved position comes primarily from falling Democratic support. Democrats are currently at their lowest level of support in the past year while Republicans are at the high water mark. Democrats began the year holding a six- or seven-point lead over the GOP for the first several weeks of 2009. That began to slip in early February and the Republicans actually took a two-point lead for a single week in the middle of March. Since then, the results have ranged from dead even to a four point lead for the Democrats. These numbers tend to bounce a fair bit, but it will be interesting to see what these numbers do over time. I might have to add these numbers to the monthly poll roundup that I’ve decided to run from now on. Quite the correction there. Incidentally seven in about a week works out at 364 over the course of a year. Normal flu claims over 100,000 people each year worldwide. As I said earlier, I’m not in the least bit concerned. I had an odd dream about pig flu yesterday (although annoyingly in the dream it was referred to as swine flu). In this dream I picked up the local newspaper “The Watch” and immediately noticed the headline “103 Canberrans arrested for swine flu” whilst at the same time hearing the details of the story on the radio. According to the report, the ACT government had authorised phone taps on everyone and directed the authorities to detain anybody who coughs on the phone as this is apparently proof of swine flu. All of this was happening while I was sitting at one end of a semi-circle of people in my lounge room. Aunty Nell, my grandmother, Dad, Mum and me. After the news report, my grandmother started speaking, she announced that the news story explained why her friend had disappeared that afternoon, but the government got it wrong as it was her and not her friend who coughed on the phone. She then struggled with her chair and started coughing while she tried to get up so that she could walk to the police station and hand herself in. The unspoken understanding in the dream was that the government had arrested the non-coughing person in each of these phone calls, although as the dream ended there it is unclear if the error was ever fixed. I notice that you have not written anything about swine flu yet. Could this be because you can’t find a way to blame Barack Obama for it? I was amused by that email, and was tempted to ask Wayne why he hadn’t blamed pig flu on global warming…but I’d prefer to be serious about it. I haven’t written about the pig flu because I’m not in the least bit concerned by it. Let’s face it, I have a greater chance of catching normal flu than pig flu, but I don’t get a flu shot each year. I have far more pressing concerns, such as job applications. If I do happen to catch the pig flu, well so be it…when it kills me, I’ll be sure to turn in to refrigerated bacon slices which can be bought at your local supermarket (that is, if the authorities allow it…which they probably won’t). That said, Wayne, you’re in luck, because I had a dream about pig flu yesterday and you’ll be able to read all about it later today. Why do I get the feeling that this will turn in to another failed experiment very quickly? Commuters can expect a bus every 15 minutes during peak times and every 30 minutes during off-peak times on high-demand weekday routes when the ACT Labor Government trials new rapid transit buses in 2009-10. Chief Minister and Minister for Transport Jon Stanhope revealed today that the Territory Budget will provide $1 million for the new service, REDEX – Rapid Express Direct, to be trialled in 2009-10 between 6:30am and 7pm on weekdays during school terms. REDEX 1 will be a return service to Gungahlin, Dickson, City, Russell, Barton, Woden, Erindale and Tuggeranong. REDEX 2 will be a return service to Kippax, Belconnen, City, Russell, Barton, Woden, Erindale and Tuggeranong. Buses will run every 15 minutes from 6:30am to 9:30am and 3:30pm to 6:30pm and every 30 minutes at all other times. It immediately occurs to me that Weston has been completely missed from this service, meaning that Westonites need to travel to Woden to utilise it. Fyshwick is also missing, as is deepest darkest southern Tuggeranong (a fairly large area) and the Eastern areas surrounding Red Hill. I’ve said it before (although I don’t recall ever saying it on here) and I’ll say it again. The only way to get people to use the bus service in droves is to run direct centre-to-centre runs, in both directions, at regular intervals at all times of the day and weekend. When I worked in Weston, the bus was not even a remotely viable option due to the fact that, in order to get to Weston at 8am, I needed to be out the door shortly after 6am. Much easier to drive to work at 7:45am. When ACTION eventually did produce an express service from the City to Weston, they decided that people would only need to go from Weston to the City in the morning, and the reverse in the afternoon. A direct City to Weston service in the morning would have made the bus a viable option, even though it would have taken longer than driving. I really doubt that ACTION are going to tap in to a market of Gungahlinites who travel to Tuggeranong each day…with that service visiting Dickson and Russell and Barton, I wouldn’t be surprised if people will be able to drive directly from Gungahlin to Tuggeranong, back to Gungahlin and to Tuggeranong again in the time it will take that bus to get there. In fact, when the service is operational, I intend on testing my theory. ACTION and Mr. Stanhope, direct centre-to-centre services (and preferably, direct suburb to centre services in peak hour) are the only way you’ll attract a large influx of passengers. Yes, it will be expensive, but with Canberra growing, do you really think a bus service through almost every part of Canberra is going to be quick enough for most people to put up with? Oh…I just spotted another missing town centre…Hume! Place these words in a different order: elephant, white. Or not…a quick hint: if you read what it says rather than making up your own lines, things will be much easier…oh, and your staff will be happier as those vetted speeches tend to be more consistently in line with an administration’s message than ad-libbed speeches. They also give people like me less ammunition. Sticking to the Obamaprompter™ is a win-win for you King Obama. Back in the days when John Laws was still on the air, he would start his show with a piece of useless information. I quite looked forward to hearing this bit of information at 9:05 each morning, even if I usually forgot it by lunch time. I would also be disappointed when Lawsie was absent as his fill-ins never provided useless information…this, oddly enough, left me filling in for Lawsie and emailing useless information to certain friends. Last week whilst reading a forum, I was reminded of this (not that what I was reading was even remotely related to John Laws or his useless information) and I decided that I would start providing a weekly (and possibly more regular) piece of useless information here. I was going to start doing this yesterday, but with the public holiday and the amount of people visiting this information about Mike Jeffreys, I decided to leave the Jeffreys story at the top of page, and hold this rather trivial piece of fun nonsense until today. In future I won’t ramble on like this before the useless information, but I thought it would help to put the weekly feature in context if I did so on this occasion. Dr. Phil has an ISDN phone line in his office. Boat people (I’ve settled on that description for now) are a hot issue at the moment. I’ve made my views clear, but I’d be interested to hear yours. Poll below, and comments more than welcome. The last poll (it lasted a bit more than a week…sorry about that) was more adamant in its resolve than I expected. Do you support Canberra Airport’s expansion to a full international airport? Only if aircraft noise is kept to a minimum. No, big planes belong in Sydney! I’m glad to see that I’m not alone in thinking that an international airport is a great thing for Canberra! A federal appeals court had some advice Friday for anyone whose reputation gets trashed on talk radio: Don’t bother suing for slander, because no one reasonably expects objective facts from the typical talk show host. That’s not slander, the court said, because slander and its written counterpart, libel, are false statements of fact that damage someone’s reputation. An assertion that might otherwise sound factual – that the retailer lied – would be interpreted as opinion by any reasonable talk show listener, the court said. Martino’s program “contains many of the elements that would reduce the audience’s expectation of learning an objective fact: drama, hyperbolic language, an opinionated and arrogant host, and heated controversy,” the three-judge panel said, upholding a judge’s dismissal of the suit. Besides, the court said, Martino was obviously relying on the caller’s version of the facts and had no apparent reason to question it. That means he was just giving his own opinion of someone else’s account, and wasn’t making factual claims of his own, the panel said, citing a past ruling that allowed similar reliance on news articles. Independently of this story, a similar thing happened to me last week. I was talking to someone about the upcoming demolition of the Belconnen Bus Interchange and they started probing me for information because, a few days earlier, they had gone to the ACTION information shopfront in Civic for information, only to be told by the bloke manning the booth that they “don’t have any information about it”…clearly nonsense considering that the information has been on their website for some time. My reaction to this story was “well, he’s [the person at the ACTION booth] either an idiot or he lied to you”. I am forced to wonder whether ACTION, or the person manning the booth, would be mounting a defamation case against me today if this had played out in a broadcast situation…or if in fact they will consider coming after me now that I have written this? Whilst I don’t consider my comment to be defamatory in the slightest, I have to admit that I don’t trust the Australian court system to come to the same conclusion. The shock has worn off, but the disbelief hasn’t. 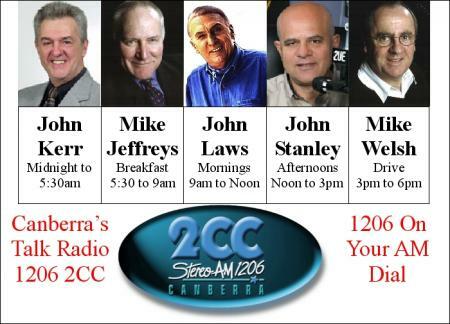 2CC have apparently fired breakfast host Mike Jeffreys. I say “apparently” because the actual mode of Jeffreys’ departure (be it dismissal, redundancy, quit) are not known, although given his rapid disappearance from the 2CC website (his profile, listing in the schedule and his podcasts are gone, although they haven’t deleted all of his photos yet…I did have to dig a bit to find them though), dismissal is the most likely option. The rumour circulating at the moment is that Mark Parton is taking over as breakfast host, although I can’t confirm it as tomorrow is a public holiday and Mike is therefore expectedly absent from the lineup. The rumour does make sense though, as 2CC have just bought the rights to the satirical series “How Green Was My Cactus” which used to air on Mark Parton’s old stomping ground, Mix 106.3…and quite frankly, I can’t imagine Mike Jeffreys allowing such an interruption to his show multiple times per morning. As for why Mike and 2CC are separating, RiotACT are speculating that it’s to do with the recent defamation action against 2CC and Mike Jeffreys by (the now late) Koomarri CEO Margaret Spalding. (Personally, having listened to the broadcast in question, I think Mike’s comments were not defamatory, and were a reasonably held opinion backed up by a number of facts, but I’m not a lawyer). I doubt that the defamation action is the sole reason for Mike’s departure, especially considering that talk stations often receive defamation lawsuits…it’s just that most aren’t publicly well-known. The rumours abound that certain senior staff at the station are not exactly best friends with Jeffreys, so I would be more inclined to believe that it’s a combination of the recent ratings result in which 2CC ranked second last in the listed stations and the publicity surrounding the defamation case, giving some people a good excuse to get rid of somebody they don’t particularly like. Obviously this is only a theory, but without further information, it’s the only logical conclusion I can draw. So, what now for 2CC? Well if previously leaked information about Mike’s ratings are anything to go by, this is probably not the best time to let him go. Mike has traditionally rated pretty well for the station, even if the station overall has not. I struggle to see how 2CC can hold its breakfast share in the short term and I now expect the next survey to see another fall for 2CC, possibly far enough to put them in last place. This isn’t to say that Mark Parton can’t make his way in the timeslot…I’m sure that over time he will grow an audience of his own, but if I had to choose a replacement breakfast host it would be Mike Welsh, not Mark Parton, and I have a very good reason for this. I am yet to see proof of Mark’s aggressive streak, he’s a “nice guy” of radio who can launch the occasional necessary tirade, but just doesn’t strike me as being aggressive enough to keep the local politicians in check. Welshie on the other hand has a good track record doing just that, and in my opinion would shed less of the existing Jeffreys audience than Parton. Don’t get me wrong…I like Mark, he’s a nice guy and he did a great job filling the 9am-midday shift over Christmas/New Year, but I don’t think he is the right person for a hard-hitting breakfast show. Mike Jeffreys is THE strong conservative voice of Canberra Radio in the morning, and I think this has been one of their main draw cards. As far as I’m concerned, Canberra no longer has a strong conservative voice in the morning. In the long term this could prove to be a good thing for 2CC as this is a fairly left-wing town, but that will only work if they drop a lot of the 2UE programming…a move which would be a disaster for the conservative movement in Canberra, and would require a lot of rebranding and reworking of 2CC program lineup. As for Mike Jeffreys, I’ll miss him. I’ve been listening to him for six years and he is, in my view, one of the best talk hosts in the country. I only hope that he resurfaces on radio soon…and perhaps with Alan Jones dropping back to part time next year, there may be a slot for him up at 2GB. In the meantime, I hope he starts updating his website again. Also I should note that Mike Welsh is the only remaining person in the timeslot listed on the poster I made in 2005 for my school bag. For this reason, Welshie will be getting a signed copy of said poster. I should also mention that I am now undecided as to what I will be listening to in the morning. As I said earlier, I like Mark, but without meaning to offend him in any way, I would probably prefer to listen to Alan Jones on 2GB Sydney or Rush Limbaugh, Sean Hannity and Mark Levin (depending on timezone differences) on KXNT Las Vegas or James Scott on 1WAY FM Canberra at that time of day. I will give Mark a go though. Mr Debus said the successful interception demonstrated the effectiveness of Border Protection Command’s surveillance. “Our surveillance is strong and targeted and officers from Customs and Border Protection and the Royal Australian Navy are working together to protect Australia from unauthorised arrivals. An oil rig tender vessel had tipped off the Customs and Border Protection hotline about the vessel. The sighting was then confirmed by a Customs and Border Protection Command Dash 8 aircraft. Perhaps it is effective…if Mr. Debus expects boat to be spotted by third parties rather than the people who are being paid to conduct the surveillance. It’s no wonder that the boats are flooding in to Australian territory with people like Bob Debus in charge of our border security.